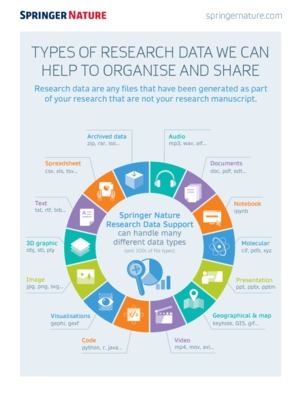 This poster highlights how the team at Springer Nature developed and implemented standardised research data policies to better help researchers and editors share and find the research data that underpins research published at Springer Nature. To promote publication of reproducible research and support compliance with research funder and institution policies, in July 2016 Springer Nature became the first publisher to introduce a standardised, common framework for the research data policies for its scholarly journals. To develop the framework, an expert working group audited existing research data policies and identified common features and. consulted with approximately 30 editors, covering all research disciplines, to gather requirements for data policies. Academic editors, librarians and funders’ feedback also informed development of the framework and the creation of supporting resources, which include a Research Data Support Helpdesk. Four types of data policy were defined, in recognition that some journals and research communities are more ready than others to adopt strong data policies. As of August 2017 more than 1000 journals have adopted a standard policy and pilot Data Support Services, providing data curation and deposition support, have been introduced. To explore standardisation and harmonisation of data policy across funders, institutions, repositories, societies and other publishers the policy framework is available under a Creative Commons license and a Data policy standardisation and implementation Interest Group within the Research Data Alliance (RDA) has been formed.